If you are thinking of moving in, to, or from Camberley our house removals teams are on hand to assist. We are dedicated and highly committed to offering a premier service for removals in Camberley and throughout the years have consistently maintained an excellent reputation for our removal services. Central Moves will carry out your removals Camberley from any type of property from a 1 bedroom flat on the 3rd floor to a 8 bedroom mansion. Central Moves specialise in the moving of Grand Piano’s, Antiques and Fine art you can be rest assured that your highly valuable items will be moved with the utmost care. Testimonials from previous customers including one of our regular customers “HAMPTON COURT PALACE”. You find these testimonials on-line in our news section or on request. As a removal Company for Camberley Surrey we have good knowledge of the roads, offices, houses and estates. If you do not have a driveway or there are resident only bays outside your property or if you think parking will be a problem on the day of your move it is advisable to apply for a parking or yellow line suspension. You can reserve up to 5 bays outside your property on any selected day including weekends. 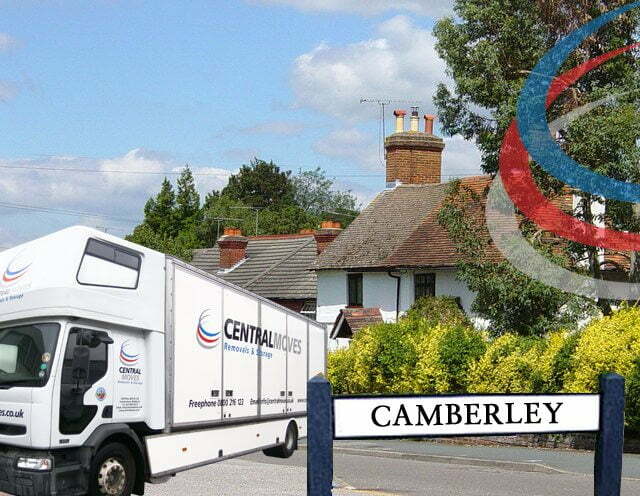 Camberley is one of the most desired destinations for Central Moves’ customers. The vibrant town has a lot to offer its residents and visitors, so attracts families and individuals from all walks of life. Ideal for commuters, Camberley is just a few miles southwest of central London, right next to the M3 motorway and has a rail link directly into London Waterloo, (under 1 hr, 20 mins at peak times). Camberley railway station is immediately south of the commercial centre on the Ascot to Guildford line, connected to Guildford, Aldershot and Ascot. Camberley is the main town in the borough of Surrey Heath and Central Moves has moved many people into its suburbs, including Yorktown, Crawley Hill, Diamond Ridge, the Old Dean district and Heatherside. Central Moves has also moved many individuals and families to the ‘The Atrium‘; the 7-acre development west of Park Street. The Atrium comprises of over 200 mid-rise apartments plus an impressive range of leisure and retail outlets. If you would like any further information regarding our removals and storage services please feel free to contact us.